These are my absolute favorite chocolate chip cookies! and they melt in your mouth. 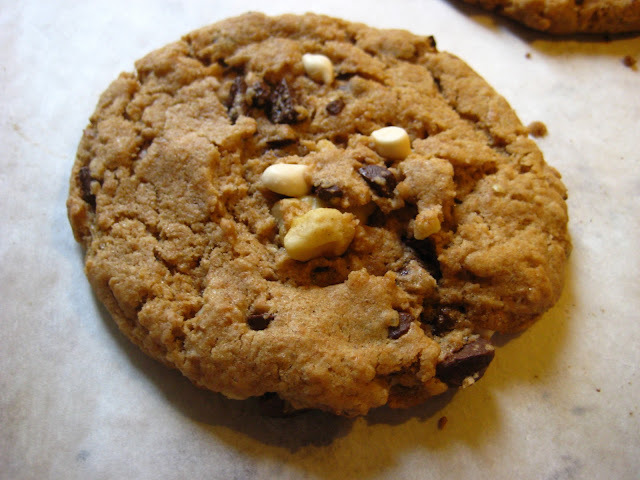 They're a classic chocolate chip cookie- minus the eggs and butter! And the addition of just a smidge of blackstrap molasses adds a little extra richness. This recipe is based on Dreena Burton's Homestyle Chocolate Chip Cookie recipe which can be found in her cookbook Vive le Vegan! . They are super tasty and even easier to make. In fact, you can watch her make the cookies and see for yourself! Vive le Vegan! was actually my very first vegan cookbook! My first ever vegan baking experiments were inspired by this fabulous vegan lady. I often follow her recipe for these cookies to the letter since it's already so perfectly delish, but I usually like to put my own little spin on them :) Therefore, I am calling these Double Chocolate Chip Nutty Cookies! I reduced the amount of chocolate chips and substituted some of them for vegan white choco chips! I added ground flax seeds and toasted walnut chunks for extra fiber. I subbed spelt flour for the wheat flour. I swapped the canola oil for delicious almond oi. In a large bowl, whisk the dry ingredients to remove lumps and combine. In a smaller bowl, whisk the wet ingredients. Add the wet mix to the dry, along with the chocolate and nuts, and mix until everything is incorporated but try not to over mix. Nobody wants rubbery, tough cookies! Scoop dough by the tablespoon-full (I sometimes use one of these if I'm not feeling too lazy, hehe) and drop onto parchment paper lined baking sheet. Lightly flatten with the flat side of a spatula or smooth underside of a glass. 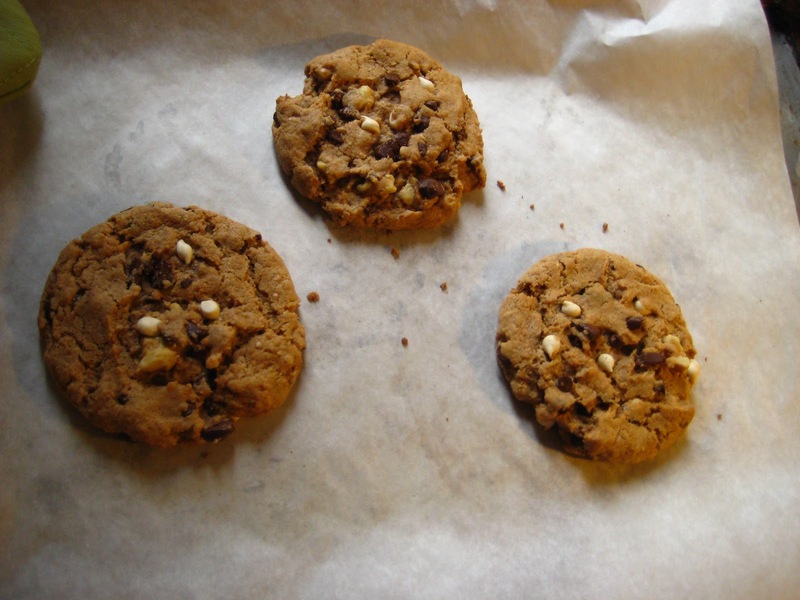 Or don't flatten at all if you like high-rise style cookies- they'll end up chewier anyway! Bake for about 10 minutes (depending on your oven... and cookie size) or until the bottoms begin to brown. You can check this by opening the oven door just enough to gently lift up a cookie with a metal spatula to take a peek. Gorgeous cookies Lisa! Nice adaptations, they look pretty irresistible. :) And, your blog name is EXCELLENT (tell your boyfriend)!